Sturino, Franc. "Italian Canadians". The Canadian Encyclopedia, 19 January 2017, Historica Canada. https://www.thecanadianencyclopedia.ca/en/article/italian-canadians. Accessed 24 April 2019. Italian Canadians are amongst the earliest Europeans to have visited and settled the country. The steadiest waves of immigration, however, occurred in the 19th and 20th centuries. Italian Canadians have featured prominently in union organization and business associations. En route to Ontario in the early 20th century. Many Italian men came to Canada through American ports and looked for jobs in railway construction (courtesy United Church Archives). Italian Canadians are amongst the earliest Europeans to have visited and settled the country. The steadiest waves of immigration, however, occurred in the 19th and 20th centuries. 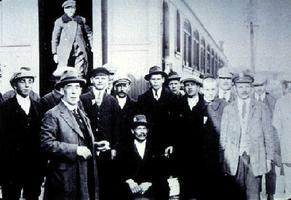 Italian Canadians have featured prominently in union organization and business associations. As a group, they were singled out as enemy aliens due to Canada's allegiances in the Second World War, and have been stereotyped as mafiosi due to widespread portrayals of organized crime as an Italian phenomenon. However, the community as a whole has thrived in Canada, and Italians have played a major role in developing and promoting multiculturalism. The earliest Italian contact with Canada dates from 1497, when Giovanni Caboto (John Cabot), an Italian navigator from Venice, explored and claimed the coasts of Newfoundland for England. In 1524, another Italian, Giovanni Verrazzano, explored part of Atlantic Canada for France. Under the French regime in the 1640s, Francesco Giuseppe Bressani was part of the Jesuit missionary advance into Huron country and later published a sympathetic account of life in Iroquoian-speaking bands as part of the Jesuit Relations (or reports). Enrico di Tonti (Henri de Tonty) acted as René-Robert Cavelier de La Salle's lieutenant in the first expedition to reach the mouth of the Mississippi River in 1682. Italians served in the military of New France (e.g., in the Carignan-Salières Regiment), in which several distinguished themselves as officers. Several hundred Italians also served with the de Meurons and de Watteville Swiss mercenary regiments in the British army during the War of 1812. Following the example of Italian ex-soldiers in New France who settled on the land in the late 17th century, some 200 of the mercenaries took up lots granted by Britain in the eastern townships of Québec and in southern Ontario. In the early 19th century, a sizable number of Italians, many in the hotel trade, resided in Montréal. Throughout the century, Italian craftsmen, artists, musicians and teachers, primarily from northern Italy, immigrated to Canada. Italian street musicians (hurdy-gurdy men, street singers) were particularly noted by Canadians, and by 1881 almost 2,000 people of Italian origin lived in Canada, particularly in Montréal and Toronto. In 1897, Mackenzie King, then working as a journalist, described the first street entertainer who lived in Toronto in the 1880s. This early Italian immigrant, King wrote, had worn out five street pianos and earned an average of $15 daily in his first years in the city. Some of the wandering street musicians eventually settled down to teach music or to organize bands and orchestras. In the late 19th century, millions of Italian peasants emigrated to South America, the US and Canada, as well as western Europe. Professional recruiters and the example of successful migrants who returned to Italy encouraged Italians to set out for North America, where work was available on the railways, in mining and in industry. By 1901, almost 11,000 people of Italian origin lived in Canada, particularly Montréal and Toronto. Although many Italians expected to achieve economic and social well-being by migrating to Canada, they were not always successful. In 1901, a series of articles appeared in a Milanese newspaper describing an unscrupulous system of recruitment from Chiasso, on the Swiss-Italian border, to Liverpool, then through Montréal to the Canadian North-West. Labourers were often misled through this system into indefinite migration to labour camps in northern Ontario, or found themselves unemployed and destitute in Canada's major cities. In 1902, the General Commissariat for Emigration in Rome sent commissioner Egisto Rossi to tour Canada and report on the situation of working Italians. Rossi documented the recruitment of immigrants through the US, especially New York, and confirmed that several powerful padroni (labour agents) in Montréal were in league with railway and steamship agents in Europe to recruit labour for a quick cash return. As a result of such conditions, in 1904 a Royal Commission to Inquire into the Immigration of Italian Labourers to Montréal and Alleged Fraudulent Practices of Employment Agencies was opened by the federal government. The commission found that although Montréal padroni recruited and often exploited Italian labourers, they in turn were acting at the behest of powerful Canadian employers such as the Canadian Pacific Railway. The Commission recommended the strict licensing of labour bureaus to regulate the recruitment of immigrants. More significantly, however, as Italians became settled in Canada they increasingly sponsored their own relatives and fellow villagers (paesani), thus lessening dependence on intermediaries. Over 75 per cent of Italian immigrants to Canada have come from Italy’s rural south, especially from the regions of Calabria, Abruzzi, Molise and Sicily, each with over 10 per cent of the total. About three-quarters of these immigrants were small-scale farmers or peasants. Unlike northern Italy, which dominated the newly formed (1861–70) Italian state and continued to industrialize, southern Italy remained rural and traditional. Overpopulation, the fragmentation of peasant farms, poverty, poor health and educational conditions, heavy taxation and political dissatisfaction acted as a "push" towards emigration. Factors that "pulled" Italians to Canada included rising expectations, the low cost of ocean travel, the example of successful relatives and friends in the New World, and the significantly higher wages there. The devastation of the Second World War, which resulted in shortages of food, fuel, clothing and other necessities, exacerbated pre-existing poor conditions. After the war, the northeastern part of Italy contributed a larger refugee component (because of the loss of Istria to Communist Yugoslavia). Friuli, which already had a long tradition of emigration to Canada, joined the southern regions as a major source of immigrants. Italian immigration to Canada occurred in two main waves, from 1900 to the First World War and from 1950 to 1970. During the first phase, 119,770 Italians entered Canada (primarily from the US), the greatest number in 1913, a year before the war interrupted immigration. About 80 per cent of these people were young males, most of whom went to work at seasonal, heavy labour in railroad construction and maintenance, mines, lumber-camps and building projects. Many labourers eventually decided to settle permanently in Canada, and by the First World War Italians were to be found not only in major urban centres but also in Sydney, NS, Welland, Sault Ste. Marie and Copper Cliff, ON, and Trail, BC. The 1911 census recorded over 7,000 people of Italian origin in Montréal and over 4,600 in Toronto. Those who settled in Canada's growing cities worked as construction and factory workers and building tradesmen, as food and fruit merchants, or as artisans such as barbers and cobblers. Out of modest beginnings, a few — e.g., Onorato Catelli of Montréal in the food-processing industry and Vincent Franceschini of Toronto in road construction — were highly successful. While the great majority of immigrants settled in urban centres, agricultural colonies were established at Lorette, MB, and Hylo, AB. In the Niagara Peninsula and Okanagan Valley, Italian proprietors of orchards, vineyards and vegetable farms prospered. Many Italian truck farmers on the cities' outskirts grew small crops for local consumption. Despite tighter immigration restrictions following the First World War, over 29,000 Italians had entered Canada by 1930. Many of them were farm labourers or wives and children sponsored by breadwinners in Canada. This movement, however, virtually ended with the Great Depression. Throughout the 1930s strong family networks and thrift helped Italian Canadians absorb some of the economic shock of unemployment and deprivation. Their problems were compounded after 1935, when Canadian hostility towards fascism was directed against Italian Canadians, many of whom were sympathetic towards Mussolini. As a consequence of Italy's alliance with Germany in the Second World War, Italian Canadians were designated "enemy aliens" and were the victims of widespread prejudice and discrimination. Men lost their jobs, shops were vandalized, civil liberties were suspended under the War Measures Act, and hundreds were interned at Camp Petawawa in northern Ontario. While a few of these men had been active fascists, most were not; and they, as well as their families, who were denied relief, bore the brunt of hostilities. As a result, many Italians later anglicized their names and denied their Italian background. After the Second World War, the widespread shortage of labour caused by a booming economy, as well as Canada's new obligations within NATO, once again made the country receptive to Italian immigration. Postwar immigrants, who numbered over half a million, came to comprise almost 70 per cent of the Italian Canadian population. Many Italians initially immigrated under the auspices of the Canadian government and private firms. The Welch Construction Company, for example, which was founded at the turn of the century by two former labourers, Vincenzo and Giovanni Veltri, specialized in railway maintenance. Men often arrived under one-year contracts to do hard physical labour similar to that of their earlier compatriots, though now the great majority came as permanent settlers, later sponsoring wives, children and other relatives. Family "chain migration" from Italy was so extensive that in 1958, Italy surpassed Britain as a source for immigrants. Starting in 1967, new regulations based admissibility on universal criteria such as education; this "points system" spelled out conditions for family sponsorship that would apply to a limited range of relatives. As a result, Italian immigration dropped significantly in the ensuing years. In 2006, 60 per cent of Italian Canadians lived in Ontario, 21 per cent in Québec and 10 per cent in British Columbia. About 95 per cent of Italian Canadians lived in towns and cities. The most significant concentrations being in Toronto, where Italian Canadians numbered 466,155, and in Montréal, where they numbered 260,345. Other cities in which Italian Canadians numbered 10,000 or more were (in descending order) Vancouver, Hamilton, St. Catharines-Niagara, Ottawa-Hull, Windsor, Calgary, Edmonton, London, Winnipeg, Thunder Bay, Sudbury and Oshawa. In the 2006 census, 741,045 Canadians listed Italian as their single ethnic origin and 704,285 listed Italian as part of their ethnic origin (multiple response) for a total of over 1.4 million Italian Canadians. In cities where Italians have settled in sufficient numbers, they have tended to create ethnic neighbourhoods. These "Little Italys," with their distinctive shops, restaurants, clubs and churches, are easily recognizable, but they have rarely been ghettos segregated from the rest of society. Over the years, these immigrant areas have decreased significantly in size, though they have generally survived as viable socio-economic centres. While the movement out of immigrant neighbourhoods to more prosperous residential areas has been significant, even in the suburbs it is still common to find concentrations of Italian Canadians who have chosen to live near one another because of kinship or village ties. Seventy-five per cent of immigrants coming in after the Second World War were employed in low-income occupations, but this changed dramatically with the second and subsequent generations. By the mid-1980s, the children of immigrants had achieved a level of higher education at par with the national average, a fact reflected in their increasingly important positions in professional and semi-professional occupations. Italian Canadians have the highest rate of home-ownership in Canada, reflecting the centrality of the family. By the 1980s, 86 per cent owned their own home compared to 70 per cent of the population generally. Much like their American counterparts, Italian Canadians have often been indelibly associated with the mafia. The November 2011 Charbonneau commission inquiry into the corruption of public officials in exchange for construction contracts may have added to the public perception of crime as a mostly Italian activity. Fueled by the dozens of murders which took place following the arrest, extradition and incarceration of Montréal mafia boss Vito Rizzuto in 2004. However, as the 2010 report from Criminal Intelligence Service Canada states, "There is not a single dominant organized crime group across Canada." Mutual-aid societies, many of which grew out of village organizations, were among the earliest institutions established by Italian immigrants. The Order of the Sons of Italy (the first Canadian branch was established in Sault Ste. Marie in 1915) was open to all people of Italian heritage. In 1927, some Québec lodges, opposed to the order's pro-fascist leanings, broke away to form a parallel structure, which a decade later was renamed the Order of Italo-Canadians. Wartime hostilities inhibited the work of the mutual-aid societies, but their decline was really made inevitable by the growing influence of the welfare state and insurance companies. 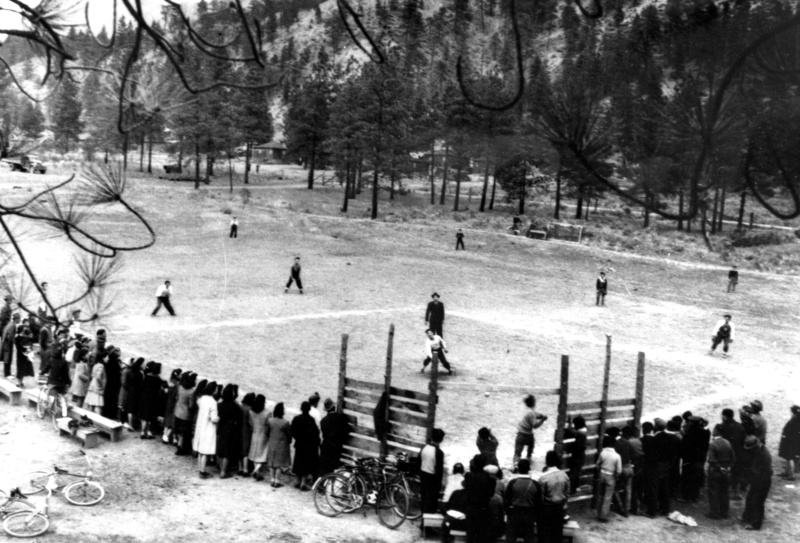 After the Second World War, numerous new clubs and societies were established around regional, religious, social or sporting functions. Building on the work of the Italian Immigrant Aid Society, in the early 1960s the Centre for Organizing Technical Courses for Italians (COSTI) was founded in Toronto to provide technical education and upgrading, as well as English courses and counselling. In the mid-1970s, COSTI also established a special program to meet the needs of immigrant women and during the next decade expanded to assist many newer immigrant groups (e.g., Chinese, Portuguese, Latin American, etc.). In 1971, the Italian Canadian Benevolent Corporation (ICBC) was founded in Toronto. Undertaking what was the largest project of its kind in North America, the ICBC built a multifaceted complex with senior citizens' housing and a community centre offering recreational, cultural and social services. Similar projects followed in quick succession in Italian communities across Canada including those in Thunder Bay, Winnipeg and Vancouver. The founding in Ottawa in 1974 of the National Congress of Italian Canadians was an attempt to bring national cohesion to the greater Italian Canadian community and increase its political influence. The congress coordinated the raising of millions of dollars from across Canada to provide relief for the victims of earthquakes that devastated Friuli in 1976 and Campania and Basilicata a few years later. In the late 1980s, the congress took up the issue of the wrongful internment of Italian Canadians during the Second World War, for which it received an apology from the prime minister. Given the large size of the group, it is not surprising that internal divisions would occur along regional, political, generational and class lines. The Canadian Italian Business and Professional Association and the Italian Chamber of Commerce represent the interests of employers and professionals, while working-class Italian Canadians have sought to protect their interests through various organized labour movements. Comprising a conspicuously large proportion of the labour force in both the construction and textile industries, Italian Canadians have been especially prominent, for example, in the International Labourers Union and the Amalgamated Clothing Workers of America. Like many major community organizations, the Italian-Canadian press and media have promoted cohesion and have mediated between their constituency and the wider society. The first Italian newspaper in Canada was published in Montréal in the late 19th century; by 1914, several others had been founded from Toronto to Vancouver. After 1950, dozens of Italian newspapers and magazines, many aimed at particular regional, religious or political markets, proliferated across Canada. By the mid-1960s, Italian-language publications had a readership of 120,000. The most influential of these are Il Corriere Italiano of Montréal, and, prior to its demise in May 2013, Il Corriere Canadese of Toronto, which carried an English-language supplement to reach younger Italian Canadians. In 1978, the owner of Il Corriere Canadese had launched a multilingual television station in Ontario, CFMT (rebranded as OMNI TV in 1986 after being purchased by Rogers), which transmits in Italian andother languages daily. A few years later, the Telelatino Network commenced operations as a national cable system for Italian and Spanish programming. Currently, Italian and Chinese are the most widespread non-official languages in Canadian television and radio broadcasting. Italian Canadians have altered society's tastes in food, fashion, architecture and recreation, thus helping to bring a new cosmopolitanism to Canadian life. They have also made important contributions to the arts. Mario Bernardi of Kirkland Lake, Ontario, for example, was appointed the first conductor of Ottawa's National Arts Centre Orchestra in 1968 and helped guide it to international stature. The avant-garde paintings of Guido Molinari of Montréal now hang in leading galleries. At the more popular level, Bruno Gerussi, a former Shakespearean actor, became a well-known radio and TV personality. Among the many writers of Italian background are J.R. Colombo, a best-selling author of reference works and literature, and the Governor General’s Award-winning author Nino Ricci (see also Italian Canadian Writing; Ethnic Literature). Dante Alighieri societies throughout Canada offer films, lectures, Italian-language courses and other programs to foster knowledge of Italy. In 1976, the Canadian Centre for Italian Culture and Education was founded in Toronto to design and institute Italian-language programs in schools. Also important are the cultural institutes run by the Italian government, the Italian-language holdings of public libraries and the many Italian clubs in universities and high schools. The 1970s ushered in major changes in Canadian education as a result of the adoption of multiculturalism in public policy. By the mid-1980s, all provinces, except for those of Atlantic Canada, had developed heritage language programs, which included the teaching of Italian where sufficient demand existed. In Ontario, over 40,000 elementary school students were enrolled in Italian courses, comprising almost half the total enrolment in non-official languages. Great strides were made by Italian Canadians in educational achievement, as reflected in post-secondary statistics. By the mid-1980s, the percentage of Canadian-educated Italians (Canadian-born and those emigrating before age 15) with a university degree was above the 10 per cent mark, which represented the total population. Over one-quarter had a community college education, 3 per cent more than overall. Over 7 per cent of male Italian Canadian students were enrolled in the professional fields of law, dentistry and medicine (which was at par with the average for all groups) and had one of the highest proportions undertaking graduate studies. Italian ethnicity in Canada is closely connected to Roman Catholicism, the faith of 95 per cent of Italian Canadians. Historically, the Catholic Church has sought to minister to Italians through religious orders, especially the Servites in Montréal, the Franciscans in Toronto and the Oblates in the West Coast. Scalabrinian priests specializing in work with immigrants became active in major cities after the Second World War, and great expansion occurred in the 1960s when many national parishes and Italian-language services were established across the country. By 1970, Montréal's Italians were being served by eight churches, while in Toronto (where they accounted for one-third of the city's Catholics) they were served by three times this number, and by 65 Italian-speaking priests. As well as addressing the spiritual needs of its members, the church has been involved in immigrant aid, education and recreation, and contributed toward the preservation of the Italian Canadian community’s language and culture. A distinctive Italian-Canadian Catholicism has been preserved by two major practices — the honouring of the saints' days throughout feste and the celebration of the sacraments (especially marriage) through banquets. These practices are both religious and social and often bring together several hundred relatives and paesani. In daily life, the influence of Catholicism can be seen in the strong family values of Italian Canadians, which give the group higher rates of marriage and fertility, and lower rates of divorce and separation, compared to the overall Canadian average. The majority are opposed to divorce, abortion and even artificial contraception. Most Italian Canadians believe they have a responsibility to care for aged parents, a conviction reflected in living arrangements showing almost half in multi-family households. The first successes of Italians in politics occurred in northern Ontario and the West Coast rather than major cities. 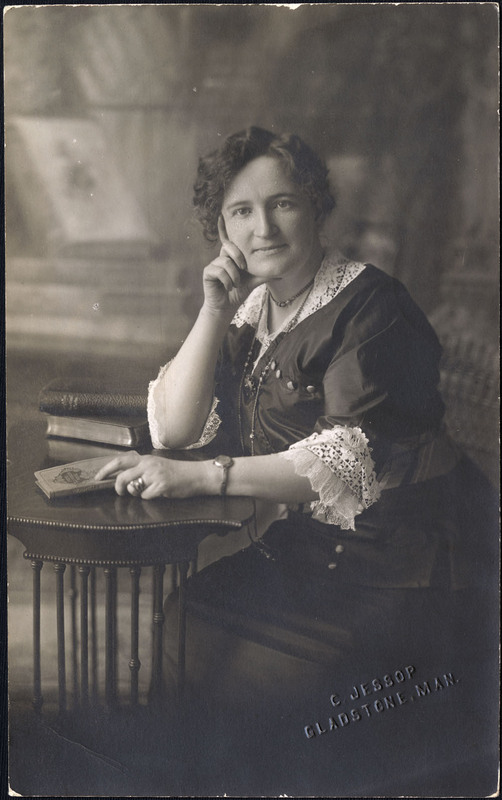 Through the 1930s, Italian Canadians were elected to local councils and mayoral offices in Fort William (now Thunder Bay), ON, Mayerthorpe and Coleman, AB, and Trail and Revelstoke, BC. One of these, Mayor Hubert Badanai of Fort William, in the 1950s was elected as one of the first Italian federal members of Parliament for the Liberal Party. In 1952, Philip Gaglardi of Mission City, BC, was elected to the provincial legislature for Social Credit and became the first cabinet minister of Italian origin in postwar Canadian politics. However, it was not until 1981 that Charles Caccia — initially elected as a Toronto MP in 1968 — was appointed the first federal Italian-Canadian cabinet minister by Prime Minister Trudeau. Moreover, a former St. Catharines councillor, Laura Sabia, became chairperson of the Ontario Council on the Status of Women in 1973 and a leading activist in the women's movement. Federally, the Italian vote has generally supported the Liberals, partly because they were perceived as being more open toward immigration and more committed to multiculturalism. Like other Canadians, Italians have tended to vote differently at the provincial level. In both Ontario and British Columbia, for example, many have supported the New Democratic Party. In the 1984 federal election, however, the Progressive Conservative Party made gains among the group, especially in Québec where two Montréal candidates of Italian background were elected. By the mid-1980s, Italian Canadians had attained a level of political representation commensurate with their numbers. In 1993, 15 Italian Canadians were elected to Ottawa. This comprised five per cent of House of Commons seats, which compares favourably with their standing at about four per cent (multiple origins) of the Canadian population. As of 2012, 14 members of Parliament had been born in Italy. While group cohesion among Italian Canadians has been provided by a sense of shared history, community institutions, and distinctive cultural and religious traits, cultural conservation rests upon the bedrock of the family. The most significant social institution among Italian Canadians has been the family, both nuclear and extended. Commonly, in the traditional family in Italy the roles were clearly defined, mirroring similar patterns around the world. The husband was considered family head and provider; the wife was expected to be a good homemaker and mother. Children were to show obedience and respect towards their parents. Each member was to act for the betterment of the whole family rather than for his or her individual interest. Many Italian immigrants have attempted to maintain such family patterns, but change was inevitable. Because traditional ways differed markedly from what was expected in the wider Canadian society, the resulting conflict was often at the root of many social problems. At times the children of immigrants have found that their aspirations for upward mobility and individual expression conflicted with the family's insistence on solidarity and the fulfilment of traditional roles. The second-generation Italian-Canadian family, however, has changed considerably. While usually maintaining an emphasis on family cohesion, respect and loyalty, it has increasingly moved toward a greater equalization of roles between husband and wife. The family still provides its members with important support, and the extended family (relatives to third cousin) is frequently reunited at weddings, baptisms and similar events. Often friends are drawn from the extended family and economic favours are exchanged among family members. Related to this, local loyalties among Italian Canadians from the same village often link extended families into a much larger group (paesani) connected by personal bonds. This is not to suggest, however, that Italians have wished to live as an ethnic enclave. Prewar Italian-Canadians, by 1941, had a higher rate of intermarriage (45 per cent) than most other major ethnic groups and in the postwar period a similar rate was again reached by the mid-1980s. In Québec, Italian Canadians integrated more easily into the francophone society than do many other cultural communities. The 2006 census recorded 476,905 Canadians who reported Italian as their mother tongue (first language learned). The expansion and consolidation of the Italian-Canadian community since the Second World War has been due to a strong degree of commitment on the part of immigrants and their children. The resulting high level of institutional completeness provides Italian Canadians with the possibility of expressing their ethno-cultural identity through a wide spectrum of activities, ranging from Italian-language television to sports leagues. Within the private realm, the family and religion have been interrelated pillars of cultural continuity Both maintain greater importance for Italian Canadians than in the general population. Despite the growing proportion of the Canadian-born and increasing level of cross-cultural union, Italian family and moral values have persisted to a significant degree. Identification with the Famiglia and cultural group is a major means of providing Italian Canadians with a sense of security in the midst of an impersonal mass society. Interestingly, the census suggests that many children of mixed marriages are likely to identify themselves as Italian Canadians; hence multiple-origin Italian Canadians increased more than threefold between 1981 and the mid-1990s.